Recently I returned from an extraordinary trip. With eight others from the college at which I work, I journeyed for two days to Fraser Lake, a town along the picturesque Yellowhead Highway, about 150 kilometres west of Prince George, the “capital” of northern British Columbia. It was more pilgrimage than student trip. We were about “service learning” to be sure, but that sounds too much like programming, and the experiences eclipsed anything curricular or planned. It was communal, personal, educational, spiritual, cultural and adventuresome all in one, and stretched our horizons in ways we are still digesting. I, for one, am still appropriating the sights, sounds, prayers and encounters that were constitutive of our way. Perhaps all pilgrimages are like that. Just as the travelers in Chaucer’s Canterbury Tales, we each had our story, our strengths and our weaknesses, which are magnified when one is dislocated from regular routines and structures. It was about leaving the security of home, like Bilbo Baggins, for an adventure in which one’s safety could not be guaranteed (and indeed, for some, there were unfortunate mishaps). It was about unplugging from our electronic devices, which normally hold sway over our self-manufacture. It was about leaving the “city of man” for the wilderness, where one can breath a different air and where new voices can speak. It was about becoming vulnerable to change, in ways we could not necessarily anticipate. It was about renewal of mind and heart, of seeing other ways of life and receiving amply from the generosity of others. The line between being a giver and receiver was always blurred, and in that respect it was, perhaps, an experience of communion. For a number of days we listened to people who knew Rose Prince, the native girl who died over 60 years ago, and is now regarded as a holy woman of faith and heavenly intercessor, and whose body is buried on a hillside plot overlooking the lake at a place called Lejac. These witnesses included the 91-year-old nurse who was present when she died in hospital, and who attested to her remarkable serenity and joy. There was the last surviving witness of her bodily incorruption, a retired Métis RCMP officer who was a boy when the coffin was opened and who recalled the perfect and beautiful state of her body. 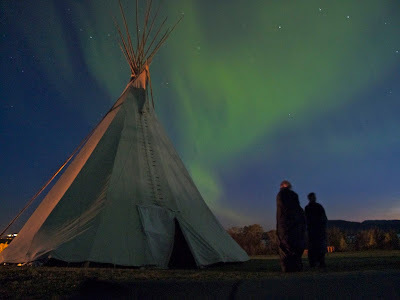 We heard the native elder who was her classmate in residential school, and recounted her prayerfulness and way of acknowledging your presence with her own deep and personal presence. And there was the man who told how his broken back was healed after weeks of agony, astounding his doctors who were about to cut his spinal cord which would have paralyzed him waist-down. The local priest had come and applied a paste of dirt from Rose’s grave to his back. He fell into a deep sleep, the first time in weeks, and woke up completely healed and pain-free. To the wise, these stories are foolish. But God has not revealed them to the wise. One feels small in contexts such as these. 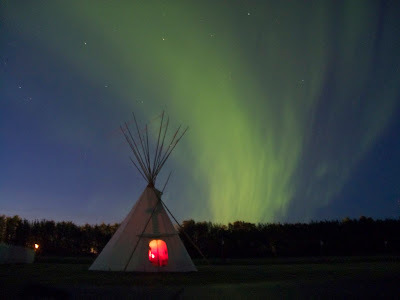 And just to underscore the reality that I am just a little person in this vast universe, one glorious night, as students were returning to our teepee from the prayer-tent across the field, a magnificent spread of aurora borealis covered the sky. It seemed to restore wonder to our hearts, to offer peace, and to remind us, once again, that “Lo, I am with you always, unto the consummation of the world” (Mt 28:20). A heart-warming account ... glad you had another wonderful experience from the pilgrimage. WOW to the aurora borealis over the adoration tent... And WOW to these stories about Rose!